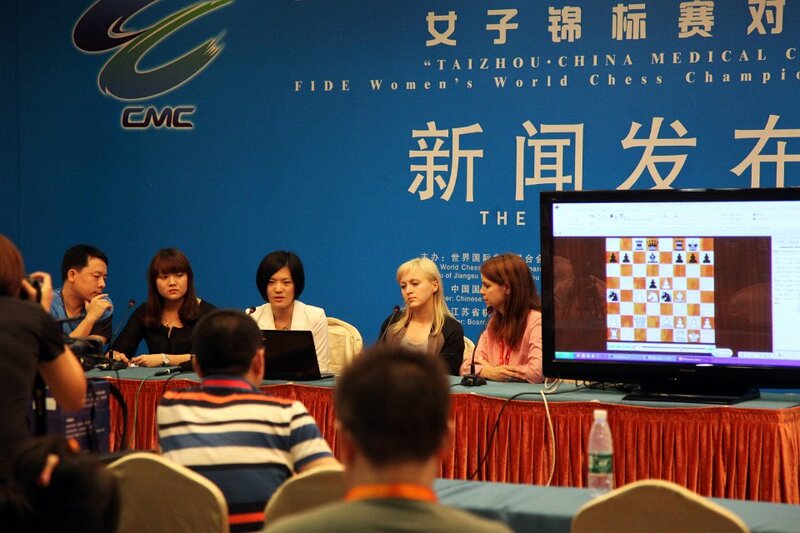 FIDE Women’s World Chess Championship starts on 10th of September 2013. The event has been traveling under the radar and has not been highly-touted in the shadows of the upcoming World Championship match. 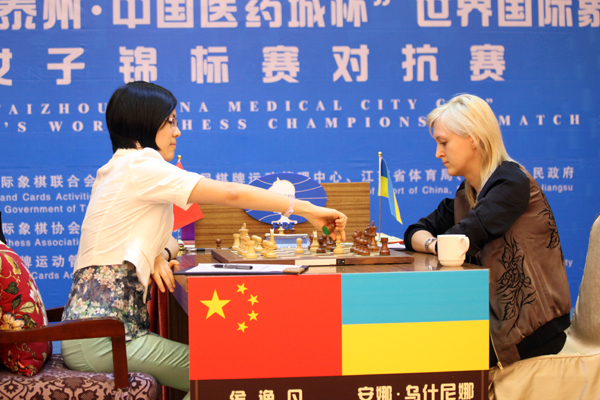 This match will feature reigning World Champion Anna Ushenina of the Ukraine and former champion Hou Yifan of China. 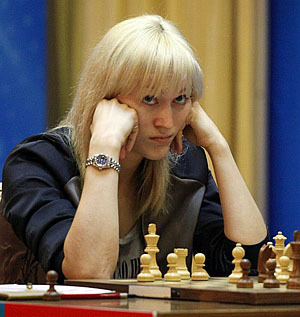 Ushenina won the World Championship (knockout format) event last year to become the women’s champion. While many are befuddled at the strange women’s cycle, the head-to-head match appears to be on format that has stood the test of time. The seemingly reserved Ushenina has not been very visible as a world champion, but performed well in the recent World Chess Cup in Tromsø, Norway defeating Peter Svidler before losing on tiebreaks. Ushenina-Hou will be a 10-game match starting tomorrow on September 10th with the drawing of the colors. The winner of the ten-game match is the first player to reach at least 5.5 points. For tiebreaking purposes, there are four rapid games (25’+10″), two blitz games (5’+3″), another two blitz games (5’+3″) and an Armegeddon game (black having draw odds). The winner will get 60% of the 200,000 euro purse and the loser 40%. If the winner is decided by tiebreak game the ratio is 55:45. 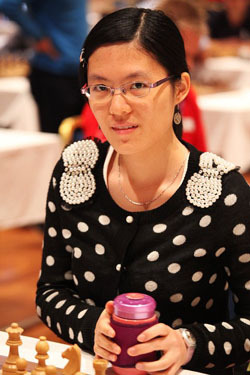 The two have played several times with Hou Yifan holding a slight edge. Despite being the challenger, she is an overwhelming favorite to reclaim the title. International Arbiters including Carol Jarecki. Anna Ushenina and Hou Yifan presented to audience! Hou Yifan chose black in the drawing. 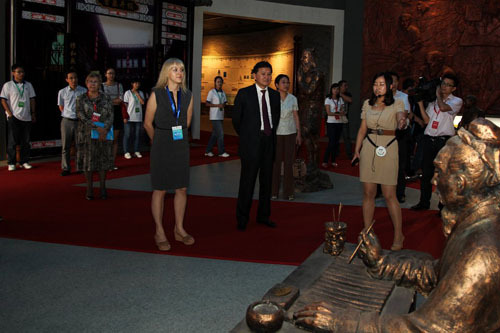 Anna Ushenina seemed to enjoy the Chinese art exhibits. Ceremonial moves kick off the 2013 Women’s World Championship! The anticipation of the Ushenina-Hou championship match has not had the fanfare of the Anand-Carlsen match, but the first game got off to a rousing start with the World Champion obtaining a nice edge out of the opening. Ushenina has developed a reputation for her intense preparation after defeating Peter Svidler in a game where she barely used any time in the first 20 moves. In this game she faced Hou’s Nimzo Indian Defense and took advantage of black’s awkward knight placement on b7. Hou had a sort of a hedgehog with the knight on b7 instead of d7. Despite this, the knight would play a crucial role in the game. Ushenina exploited weak points in black’s camp and begin to probe the light squares on d5 and f5. 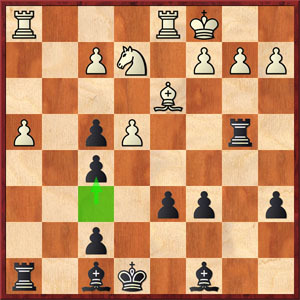 Instead of further creating a space advantage, Ushenina allowed black to cover some of the weaknesses with a number of exchanges. White’s doubled rooks were simply flailing at thin air. Black’s 36…Ng5! initiated an unstoppable attack as whites pieces were offside. The initiative began to swing in black’s favor after 29…f5 30. Rdc2 f4 31. Rc7 Qf6 32. Bb6 Nd8 33. Qb2 Rd3. All of black’s pieces were poised for a final assault. 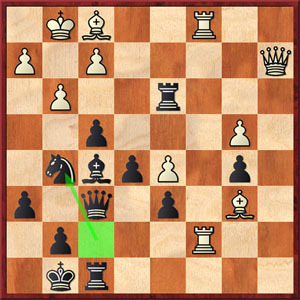 The galloping knight from b7 hopped on with 36…Ng5! the attack was unstoppable. Hou crashed through with 38…Nf3+ 39. Kh1 Qg6 40. Bxd3 Qh5+ 41. Kg2 Bh3+ with mate in one. A total collapse by Ushenina and all of her pieces were forlorn on the queenside. A very inauspicious start for Ushenina who made reference to her discomfort in playing in “the territory of your opponent.” Of course, this was as quizzical as Viswanathan Anand defending his title in Bulgaria against Veselin Topalov. Nevertheless, Anand won convincingly. Of course, she is a capable opponent and at the end of the day, better chess is what will determine the outcome. Winning would quell any such complaints. Hou has jumped into the lead, but will home-court advantage be a blessing or a curse? Ushenina will certainly make a run. Photo by Anastasiya Karlovich. 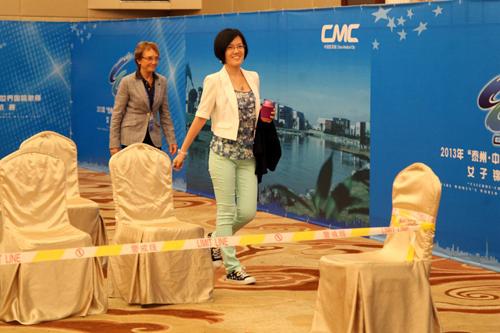 I noticed that Hou Yifan has been given the comforts of a nicer chair and a cushion. The chair has arms which can give a welcome respite from fatigue. The Ukrainian team should make a request. 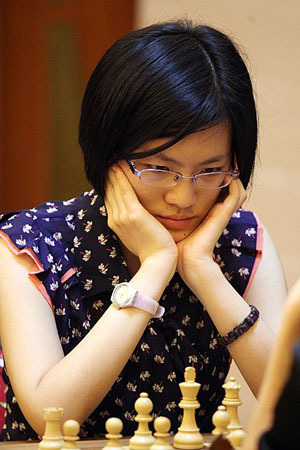 Hou Yifan has certainly turned into a ravishing young lady. She exudes confidence and her smile is endearing. However, she will need a better effort than what she gave today. 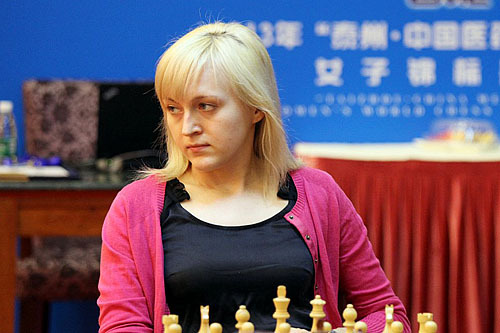 Anna Ushenina continue to show her excellent preparation as she easily held Hou Yifan in game two. The Sveshnikov is a daring Sicilian Defense that sacrifices structure for activity. The first 17 moves were theory until Hou Yifan played 18.h4. Black was able to mount typical queenside play and even fight for the initiative. Hou found a way to thwart this and managed to trade off pieces. Hou Yifan got nothing against Ushenina’s well-prepared Sveshnikov..
Ushenina’s was not impressed by the novelty and made an easy draw. In the first two games, we may conclude that the Ukrainian has brought better preparation. In the first game, she simply made a bad decision and eased the pressure. 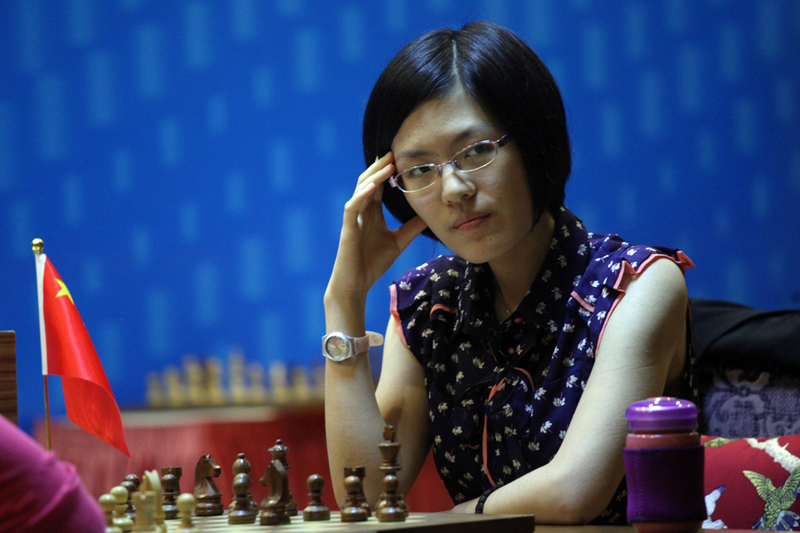 In the second game, she secured a good result and kept Hou Yifan fighting to keep the balance. Certainly there will be more theoretical battles in the eight classical games left, but the Chinese team will certainly have to improve. The nice cushioned chair of Hou Yifan will only help her so much! Ushenina’s expressions since the opening ceremonies have said it all. Today’s game between Anna Ushenina and Hou Yifan was not only a disaster by the result, but also a disaster by spirit of competition. The reigning women’s champion did not give much of an effort today as she resigned in 24 moves and questions are now swirling about her overall attitude to play a competitive match. While she is typically expressionless, she sometimes flashes a stunning smile. There would be no smiles today as disaster struck the Team Ukraine. Ushenina trotted a slightly more aggressive try with 5.e4!? but black seemed to have no problems equalizing. Black’s pieces soon had active play and apparently the Ukrainian did not sense the danger. She may have missed her chance with 18.Bxf7+ and played 18.a4? 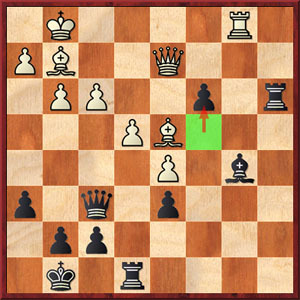 Hou Yifan uncorked the tactical zinger in 18…Bxa4! and white pieces were all under assault. Down an exchange for a pawn, white’s queen scurried about trying to find resources. Black deftly returned the exchange and netted a pawn, but her pieces totally dominated the board. In the final position, white stood to lose more material. It must have been painful for a sitting world champion to sit through such an analysis of her poor play. Can Ushenina salvage respectability in this match? Photos by Anastasiya Karlovich. It appears that Ushenina is disinterested in the whole affair. 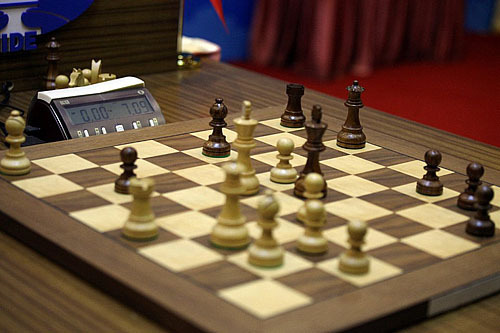 It would be a travesty of a match, but it would also force FIDE to rethink the use of the knockout system. It is difficult to explain how the #17-ranked woman is the world champion… and subsequently why she appears so unenthusiastic about defending the crown. 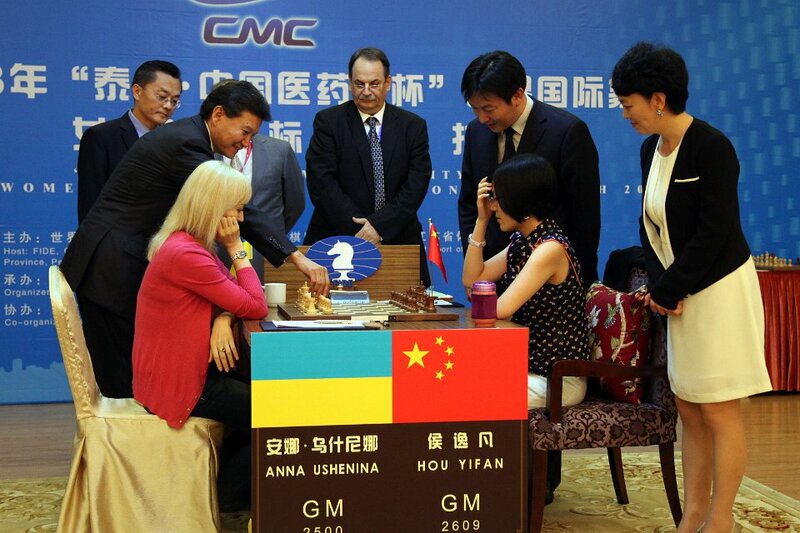 Hou Yifan and Anna Ushenina with quite different expressions. Ushenina wanted more than her hairstyle to change her fortune in this championship match. Down two points, she trotted out the Najdorf Sicilian which is reputed to be a defense used to play for a win. It suddenly turned into a Scheveningen after 6…e6 and Hou employed the sharpest line. After 6… e6 7. g4 h6 8. Qf3!? Qc7 9. h4!? Ushenina responded with preparation of her own with 9…h5!TN (9…Nc6 and 9…Nbd7 have not fared well). The game followed traditional Sicilian themes with a white pawn storm on the kingside, blockading black knights on e5 and agile minor piece play. Neither side wanted to part with the bishop pair. The two parried with minor pieces for 16 moves before a draw was agreed. Really nothing here, but of course with Ushenina down two games, the onus is on her to now win with black! Ushenina’s chances are running out. The “Tal-like” stares are not working. The Ukranian found an interesting way to deal with the trebled f-pawns with 18…Rb4! 19.Bd3 f5!? 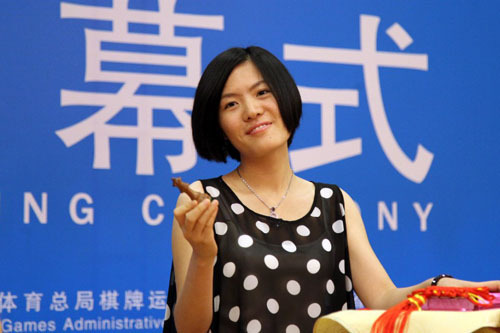 Hou Yifan would play the white pieces the second time in a row, but it appears that she prefer the black pieces anyway. There was a repeat of the first seven moves with 1. e4 c5 2. Nf3 d6 3. d4 cxd4 4. Nxd4 Nf6 5. Nc3 a6 6. Be3 e6 7. g4 h6, but then white deviated with 8. h4!? An interesting sequence ensued as black gained the two bishops and open files for a wretch pawn structure. Since Ushenina plays the Sveshikov, this is no revelation. However, Ushenina’s novel sacrifice gave her activity but nothing more. Hou played accurately and soon returned the pawn and a totally equal endgame ensued. With a two-game cushion, this is an acceptable result for the Chinese player. Her motto seems to be draw with white and win with black. With only five games remaining, Ushenina is in a must-win situation in game six. It appears as the curtain is closing on her short reign. A befuddled Ukrainian team is gobsmacked… looking for answers. Faces of joy and pain… BEFORE round six. If one can say that match play is all about psychological readiness, then they could point to the 2013 Women’s World Championship as a case study. Anna Ushenina went down once again with the white pieces. She not only lost, but lost on time… at move 40! It appears to be the last nail on the coffin on what has been a total anti-climatic rout. Ushenina overlooked 33…c3! and went from an equal position to completely losing. Nevertheless, Ushenina tried an interesting system against the Queen’s Indian with 7.Qc2 c5 8.d5 exd5 9.Nh4!? However, this turned into a favorable Modern Benoni structure with black. Hou got good queenside play while white had no real plan in the center. A tactical skirmish played out on the queenside with 31.Reb1 c4 32.Rxb5 Bxb5 but after 33.Bd4?? c3! was winning. After this, black’s pieces flooded into the queenside unimpeded. Apparently, Ushenina played 40.Bxa1 and flagged before pressing the clock. How low bad can things get for the Ukrainian. Three games down and now facing the loss of her title. Ushenina clearly did not come into this match with the right attitude and is getting a royal thrashing as her punishment. There has been complaints coming from her camp about various conditions, but it is doubtful that any of those adjustments would make a difference. While she has shown excellent preparation in some games while in others she is totally lackluster. This shows there is something going on psychologically. Word is that Team Ushenina is not happy with the food choices. I understand that they had requested “European” food… whatever that is. In addition, some of the Russian boards have state that the match will move to another room because the room they have used for six games has been rented out to a wedding party. 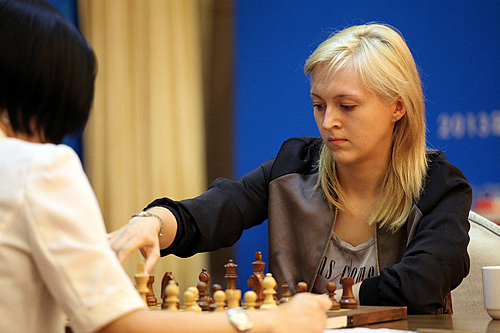 Hou Yifan dispatched Anna Ushenina to regain the Women’s World Champion. 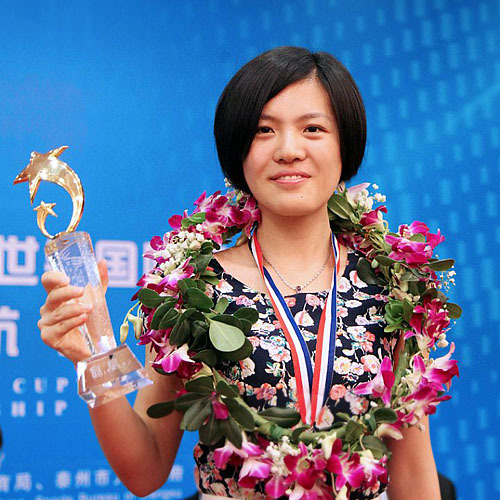 Can the 19-year old star invigorate women’s chess? 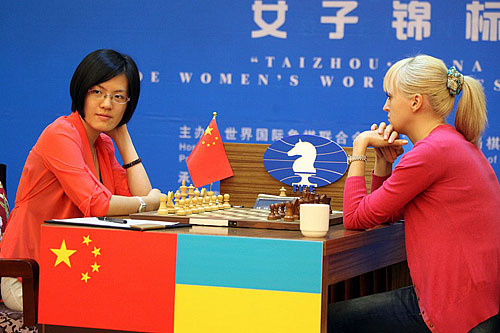 China is back on top of women’s chess! 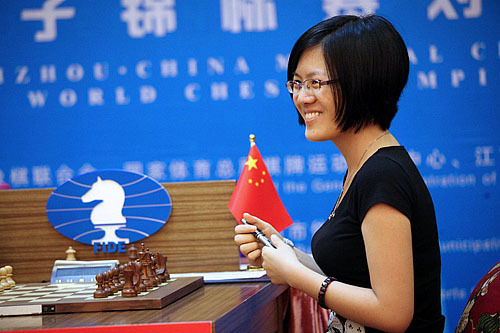 Hou Yifan clinched the 2013 Women’s World Championship with a crushing 5½-1½ win over a beleaguered Anna Ushenina. The margin of victory was a total embarrassment not only for Ushenina, but also the meaning of the title, the women’s format and women’s chess in general. Hou lost the crown last year in the championship knockout tournament (won by Ushenina) and will have to defend it next October in a knockout. What can be learned from this lopsided match? That the women’s cycle is broken and there is no place for the knockout system in determining anything other than a qualifier. Ushenina was seeded 30th in last year’s knockout and won. She is currently 17th and may fall out of the top 20 back into obscurity. 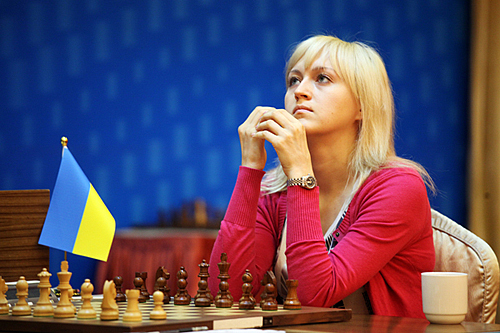 The entire scene was very sad for Ushenina and women’s chess will take a blow here. Unfortunately, the “Ushenina brand” never had a chance. Apart from her effort against Peter Svidler in the World Cup, her reign will fade into obscurity. Photos by Anastasia Karlovich. Susan Polgar was interviewed and made some salient points about the lack of attention of this match. She cited time zone, lack of English commentary, poor public relations, rating gap, obscurity of Ushenina and other reasons. Here is what she had to say about the comparisons to the upcoming men’s match. This is a very sensitive question. In general, I would like the prize funds for women to increase to men’s level. However, the players must also do their part to help create interest and marketability for their sport. No sponsor would come with millions of dollars for something that does not yield positive returns. In fact, FIDE had a hard time finding sponsors for women’s world championship. It is unrealistic to believe that they can find sponsors for the women’s world championship at the same level as Anand vs Carlsen. In addition, there is too much politics in the world of chess that directly hinders the general growth of the sport, especially for women. I have faced a lot of hurdles in my efforts to promote women’s chess in the US. I want to bring chess to the highest level to attract major sponsors and supporters. Chess politicians, on the other hand, only want to have power for life. So the battle is not with the media or sponsors. 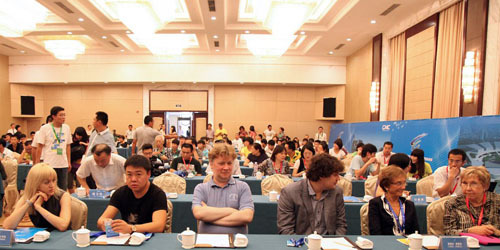 The battle for chess players from around the world is with chess politicians at all levels. Now the conversation will swirl around the chess world about how to reinvigorate women’s chess. As #17 in the world and more than 100 ELO difference, few took Ushenina as a serious opponent. Hou Yifan certainly did and was focused. Apart from Ushenina’s successful run in the 2013 World, Cup, her reign was unremarkable. Her publicity nightmare of not executing a bishop and knight mate in 50 moves did not help her cause. Now that we have a young, strong and charismatic champion, the debate will continue. Talks of a match with Judit Polgar will surface once again and perhaps women’s chess can flourish. 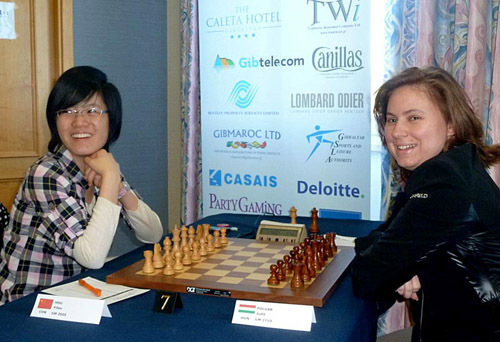 Hou Yifan facing Judit Polgar in a historic battle at the 2012 Tradewise Gibraltar Masters. Photo by Zeljka Malobabic © Tradewise Insurance Ltd. There is the idea that more women will necessarily produce stronger players. One can find many faults in this logic and has to look no further than the fact that no woman has been able to replicate Judit Polgar’s success (becoming #10) despite there being a lot more women playing than when Polgar was rising as a young teen. Let’s hope that the women’s cycle can be made consistent with the overall cycle and that standards for women’s play can increase with an emphasis on quality and not quantity of players. We seem to have a karmic band. I have once again enjoyed your writings. All good wishes for you and your chess drum.